Be the envy of the office; work with speed, precision and accuracy. The ##brand## Architect Scale Ruler is a high quality, triple sided ruler featuring 6 scales its perfect for any Architect, Draftsman, Engineer or Student. The ruler is designed to be efficient, precise and long lasting. Made of Professional Grade Fine Aluminum, the ruler is built to be indestructible, compared with cheaper plastic alternatives and can be used in every and all work environments due to its highly durable nature. Have absolute confidence in this ruler being used in any application - and lasting a lifetime! The triple sided design features space for 6 different measurement scales: 1-1 / 2 ", 1, 3/4", 3/8 ", 3/16", 3/32 ", 1/2" 1/4 ", 1/8", 3 ", 16 " and each side is color coded to match the scale - quickly, easily and effectively move between scales and never be confused which scale you are using. By flipping the ruler you have easy access to a different scale AND know which one it is from the color coding. Remove the need to carry multiple rulers, and swapping them out which can be very cumbersome when compared to ##brand##'s Architect Ruler. All printed textures have been tested and designed to be sharp. We know most rulers start to fade and the measurements are hard to read after using for a while, ultimately rendering them useless. We have specifically made sure our measurements are printed with higher quality printing and embossing to having a lifelong lasting ruler that will stretch the value of your purchase for years to come. ✔ MADE WITH DURABLE ALUMINUM: We have designed this ruler with tough materials that will last for long. Aluminum kicks the snot out of it when it comes to Quality and Durability. Made of high grade Fine Aluminum, the ruler is built to last and can handle the toughest workshops and construction classes so you won't need to worry about breaking or snapping in any application. 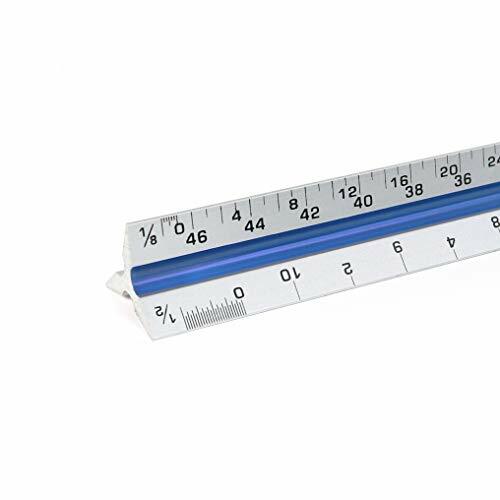 ✔ HIGHLY FUNCTIONAL SCALE RULER: We've used extremely sharp textures on the all measurements for 1 reason only - longevity. We're thinking long term, and we want a ruler that will last you forever. The measurements will not fade away or come off, they're there to stay. Meaning you won't be needing to purchase a replacement for a very long time. ✔ ENJOY UP TO 6 SCALES MEASUREMENT: With this ruler, you can cover every different kind of measurement you could need, whether you're a Architect, Draftsman, Engineer or Student this ruler is perfect fit for all design and construction work covering all bases of measurement, giving your work the precision and flexibility it needs. Scales are: 1-1 / 2 ", 1, 3/4", 3/8 ", 3/16", 3/32 ", 1/2" 1/4 ", 1/8", 3 ", 16 "
✔ UNIQUE AND ORIGINAL COLOR CODED: This high quality ruler features 3 different colours for each measurement scale, so can easily tell which scale you are using. Speed up your workflow and avoid any confusion for much more quicker and efficient measuring. It serves as the best gift idea to your loved ones. ✔100% SATISFACTION GUARANTEED: As a brand, we believe in quality not quantity! We offer lifetime guarantee on all of our products. Why? Because we are 100% Confident on the quality and value our Architect Scale Ruler brings. If at any point you are not satisfied, you can return it for a full refund. If you have any questions about this product by BS Home & Office, contact us by completing and submitting the form below. If you are looking for a specif part number, please include it with your message.